I just found out I am an uncle again. Baby Clint was born recently and I thought I would whip him up a sweater. Most of my recent experience with infants was during clinicals in school, and that was a while back. I picked up a little pajama thingy and used it for size. Well, to make a long story short, Clint will be wearing this sweater next fall. I just made a top down raglan. I knew I needed to make the neck larger for his big head as he was over nine pounds at birth. The whole thing is ending up a little large for an infant. I will pass it along to my Mother when she visits next month, along with the extra yarn. Mom can make adjustments if need be. Clint is going to end up being a hunter so I thought his sweater would be smashing in a camoflage print yarn. I think the family will get a kick out of this. Well, I know it has been a while since I posted but believe me, I have been busy. I have been knitting though. I picked up some Cascade Pastaza at a really cool place last week called Sprinwater Fiber Workshop . It was only a few blocks walk from Knit Happens . I am such a fool, I was traipsing around Old Town Alexandria on a day (Monday) that Knit Happens just happened to be closed. I did look in the window and can not wait to visit again. I looks just as I imagined it would look, very pink! I am so lucky to have access to all the knitting shops in Northern Virginia. Back to the Pastaza. This stuff is nice and soft and I could not wait to play with it. I cast on for a scarf then ripped it out, then cast on again, etc... I must have started six different scarves with this stuff and I did not like the fabric it produced but I sure like the softness. I decided I would knit gloves. Well, it has been a bit tricky as this stuff is a bit hefty and single ply. 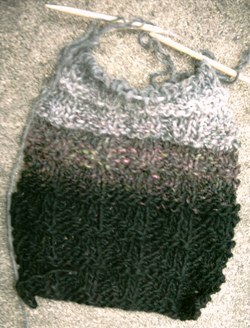 I am knitting on size 5 us needles and it took some getting used to the single ply on smallish needles. I did get the hang of it and am having fun. The color I chose is a deep green with lots of heathering in it although you would never know by looking at the above picture. I have spent a lot of time lately exploring My new "home". Every weekend we just get in the car a drive all over the place. I am really loving Virginia. I went to the DMV and got a drivers license and it only took 30 minutes! I was flabbergasted. The next day I went back to get license plates for my car and it only took 30 minutes! I was expecting an all day affair, but they have it down pat at the Virginia DMV! So, I have a drivers licens and plates for my car, I now consider myself a Virginian!